When you talk about famous delicacies perfect for souvenirs, the ‘araro’ from Bataan will surely make it on the list. If you want to try araro that uses arrow root flour which was manufactured through native processes, then you better go to Samal, as this is the only town in Bataan that does this. 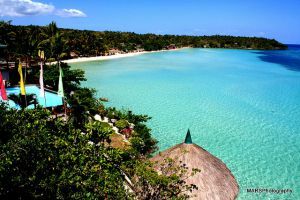 Samal is a municipality in Bataan that has highly productive farmlands and rich marine aquatic resources. They owe these good harvests to the beautiful and abundant land and seas that surround this region. And what makes the area even more inviting is it remains unspoiled and serene, seemingly untouched by the effects of industrialization and commercialization. So if you want to experience the peace and natural beauty of the countryside, come to Samal. During the Lenten holidays, crowds flock to this barangay in Samal to witness the reenactment of the passion of Christ, from the Last Supper to his crucifixion. What makes it attractive to visitors is its elaborate production that includes centurions on horseback, an entourage of weeping women, all the main characters of the story, and even a marching band. Capiz shells thrive in this municipality, and the locals have learned to make good use of them not only as food, but also as pretty decorative items. Visit the Samal Municipal Hall to see the beautiful, shiny Capiz shell columns and ceilings. Along the streets you will also see Capiz shell lamps and hanging lights, proudly showcasing the craftsmanship of the Samalenos. This is one of the famous natural wonders in Bataan. Its water cascades 120 feet down a steep-sloped cliff into a plunge pool. 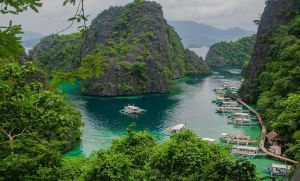 There are several rewarding bike trails around Bataan for adventure lovers who want to see the natural beauty of the place while challenging themselves to ascend hills and mountains. Several rides begin at the Samal Municipal Hall, so if you want to pump up the adrenaline level of your holiday, sign up for one of these tours. In 1596, the Dominicans were entrusted with the spiritual ministration of Samal and the church was built. It is known to be the second oldest church in Bataan, and has been rebuilt twice. The first time was after Dutch forces attacked in 1647 and the second instance was after it was burned by Katipuneros in 1896. Coming from Manila, it takes a little more than 2 hours to get to Samal by car. So if you’re up for a road trip, you can drive there and enjoy some fun pit stops. But if you don’t want to tire yourself out from driving for several hours, then it’s best to take a bus. There are several bus operators that ply the Manila-Bataan route, but make sure to check if they go to Samal as some buses don’t go directly to the municipality. Bataan Transit could be your most reliable option. However, in case your bus from Manila won’t proceed directly to Samal, there are several mini-buses and jeepneys in the capital city of Balanga that travel to the surrounding municipalities, so you can catch one of those.